Sometimes those who give their lives to Christ at a young age feel they have no testimony. They hear the stories of those who went from drugs, prostitution, murder or other extremes to a life in Christ and compare their “goody-two-shoe” lives and feel they have no story. We see the great love that those saved from the extremes have for their Lord and Savior- Jesus Christ. We desire that love. May God reveal to you the depth of His love and forgiveness. For a while now I have been teaching the boys a woodshop class. We have made napkin holders, small boxes that look like a treasure chest, shelves for their beds and now they are making shelves for there closets. Here are some photos from yesterday’s class. They are building the shelves for the closets in the new house. Jesse who has been a great help! Sanding - They didn't like the idea of doing that all day long. I am sure you already know that this last week was the 10 year anniversary that so many will remember. There are images of terror that will stay in your memory for many years to come. We will have different emotions that will rise when we revisit those memories, such emotions as anger, fear, confusion, and thoughts of revenge. I would like to turn your attention to another event that took place that has stayed in the memories of even those who were not there. World War II does not even compare to the memories, nor does Vietnam. The Civil War may be in many books, but that doesn’t even hold a bar close to this memory. Let’s go back even further to an event that has changed all of the world forever. This one event was planned for so long, was written about even before it happened, is discussed daily and will never, ever be forgotten. The event happened seemed to be at first, only affecting a few. But you have probably figured it out by now, I am talking about the death and resurrection of Jesus. Now that I have your thoughts on Jesus, let’s put those thoughts back with the event of 9-11. Those who we see as responsible for the event, those who want to see death and destruction. Those who are willing to kill or even die for their beliefs. How can you fight this enemy and win? I will tell you this, the war has already been won. Jesus is the victor, justice will be served. BUT, while we are you on the earth, what do we do to fight? I will tell you this, that no amount of bullets or bombs will actually defeat the true enemy. This battle is not of the human flesh, this battle is in the spiritual realm. It can only be truly fought and won in the spirit. The physical part of the army can only be conquered in the hearts, the spiritual enemy does not what us to see that, he wants us to fight in the physical where he can win. We should view this battle correctly and fight the way our Lord intends us to. We should be praying for those who are against us, we should be supporting our fellow believers in those territories and even send others there to spread the Gospel of Christ and to disciple the new believers. By this we will truly conquer the enemy and grow the army of God throughout the world. I hope my heart will always acknowledge God in this way. If you have not yet read the book of Job, I would suggest you set some time aside to do so. Reading Job will open your eyes up to the Lord in a greater way. The lesson Job learned is a lesson we all need to learn. To see ourselves for who we are and the Lord God for who He is. Throughout the New Testament we read how the church was formed under that covenant and we are able to see what Jesus taught. He started with twelve. These 12 men were the beginning of a fire that is still spreading today, however, that fire seems to be diminished. What began through 12 became thousands in a few short years. What was the distance between Jesus and 12 men, became thousands of miles instead of just inches. The Gospel spread and was contagious. What has happened between the time of the 12 to today? What has changed? Has God changed? Has the Word changed? Or has the message been changed? Many of us desire to see the power of the book of Acts in our lives. We want to see miracles both of the physical and of the spiritual. We want to see the ‘many’ come to Christ. Where have we fallen short of this great story? Let’s go back to some of the final words of Jesus himself and what He told us to do. He had a commission, a command if you will, of what the believer is to do. We are to reach the whole world with the Gospel. But how does one person do this? Do we go to church regularly, tithe regularly, go to bible studies and fellowship regularly? (None of those things are wrong.) How do those things spread the Gospel of Christ? What then, do we invite people to church so they can hear the pastor talk about who Jesus is? Do we tell the pastor or deacons who is sick in a hospital or who is in prison who needs to be visited? I believe the whole church is backwards or inside out in its current structure. Before you think I am going to condemn churches as a whole, or say pastors are at fault, please hear me out. What is the pastor’s role according to the Bible? Pastors are to be shepherds of the flock, teachers of the Word. They should be building up and teaching the flock, equipping them to go. The equipped flock will go out and tell others about Jesus, but not to stop there, what was the command Jesus gave His followers? To “Therefore go and make disciples of all nations” (Matt 28-19a) – make disciples! How do you make a disciple? Well, what did Jesus do? He said to follow Him. We may not necessarily say it the same way, but if we are following Christ and we can then point to Him and say “follow Him” by my example. Our discipling should not stop there, it should be on going. We need to teach the new believer how to do the same thing, equip them with the Word, walk with them in the life and stand by them in battle. This may be a weekly time set aside, it could be talking on the phone, it can be showing up when they want to tell someone about Jesus and helping them speak the truth of the Word. So, if we were to take the church and reverse the flow of thought, instead of people going to church to see the pastor and hear a message that could change you – how about go to church to be equipped to take the Word out to the world? Can we see how 12 men (11 who remained) touched thousands of lives by discipling others? Can we see the multiplication that took place? How about the reverse – can we see the duplication of the pastor being the “go to guy” who may touch and transform a few a year? Which way will actually even keep up with the population growth? Let me suggest that it isn’t necessarily your pastor. (Even though his view of the church may need to be adjusted.) How about I suggest it is me? It is I. The one who needs to go and make disciples of all the nations is me. I need to widen my world view!! I need to think how Christ wanted me to think, bigger than I ever could be! Why? Because then He will do what I can not! Through making disciples I can touch the world! Raising children is never easy. Raising them in the ways of the Lord so that they will not stray, even harder. But the mercies of the Lord are great and He can do what we can’t. We had the privilege to talk to both Jeremy and Joshua in the last week. This was our first time talking with Joshua since he went to Mexico and it seems like it has been a year (yet it has only been about two months.) He was still excited about being there and serving. Then speaking to Jeremy who was visiting the Mission for a week was also able to tell us how God was working in his life and in Joshua’s life. To be able to hear from your children that they are following the Lord, giving their life to the Lord and trying to only make decisions with the Lord can fill a parents heart with joy! I pray that all my children will one day fill my heart with that same joy as they serve the Lord. So children, bless your parents and serve the LORD. Seek Him with all your heart, mind and soul. This morning at the church service here in Sosua, the visiting pastor asked this question: How can you impress God? I thought it was a very interesting question, not only by the direction he took the answer but to really think about it, can you impress God? Sure God, look what I am doing. Look at who I am. Did you see what I did? Somehow God would be impressed? The question almost instantly brought to mind – there is no way to impress God, but there is a way to please God. When we have faith, we respond to Him. When we have faith, we obey Him. When we have faith, we can do what everyone says not to, but God said to do. It is only by faith that we can know God. Faith is also action, if you have faith you will act. When someone says they have faith, but never act on it, do they really have faith? If you say you can run, but never move faster than a walk, how does one know what you say is true? You must run, move, act out – your faith. If you feel your faith is lacking, ask God for more. Ask Him knowing He desires you to have faith and as a loving Father he wants you to have abundance of faith. I believe so many of us a missing out on what God really has for us and it all starts with faith. Do you believe God says who He says He is? Is He the Great I Am, the Alpha and the Omega, the King of kings and Lord of lords? Do you believe that Jesus really did live a perfect life on this earth, died for our sins, paid the price of that sin, rose again to glory and is coming back again? So can we impress God or should we just think about how we can please Him? Check out our friend’s music and website. 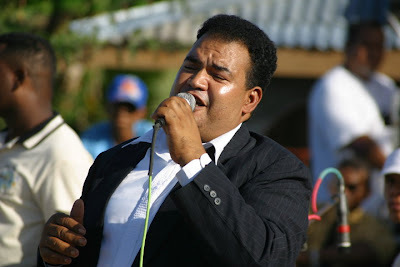 Radhames plays across the country of the Dominican Republic and other latin American countries. God has gifted him with music and preaching. During the last few months we have been helping with Niños de la Luz. This has been a great opportunity for all of us. Our boys get to practice and learn more Spanish as they talk and play with the boys who live there and Heather spends time with Summer who lives there. Jessica has been helping with the schooling of the lower grades which has also stretched her in learning more Spanish. I have been fixing things, helping with things of the new house and working with the short term teams. We have been stretched in so many ways over the last 10 months. The challenges of finding a place to live to the challenge of cars that are old and abused. The strains it puts on the family relations and testing of our faith that has grown and strengthened us. God has been good! During the first part of July some of our friends from Medford have been in Santo Dominigo with YWAM (JUCUM) and we have gone to visit and work with them. Watching our kids join in the work, learning dances, dramas and even speaking to people has been a huge blessing to me as a father. One thing you can be praying is for us to know our next big step. We have been talking about going to Mexico to a Spanish school for a few months so that we would be more effective in ministering the gospel and really being able to deepen our relationships here. We had switched programs a while back for newsletters and now we are getting close to sending out our first with the new system. Please take a moment and add yourself so that you will not only receive some awesomely beautiful photos of our family, we will (through wordy descriptions) tell of what God has been doing with us here in the Dominican Republic.